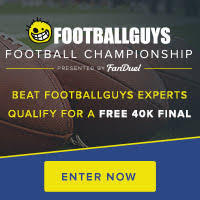 I just posted my Wild Card FanDuel stacks. I cover highly-owned stacks, less common stacks, matchups with shootout potential, and defensive stacks. Here's one stack idea. Be sure to check out the full article for tons of other stacks. Pittsburgh's pass defense makes for one of the best matchups on the slate. Unfortunately, Andy Dalton is unlikely to play. But that will lower ownership of the Bengals' AJs. Green will still see decent ownership, but rostering McCarron should help separate you from the field. Playing from behind at home in the game with the highest over-under is a recipie for fantasy success. Twist: The Steelers play well against the tight end, so fading Tyler Eifert ($6,400) to play Marvin Jones ($5,500) is the shrewd fantasy owner's triple-stack.